When we arrived in Provence, both horses were, naturally enough, inclined to walk along the left hand side of the road. Neither Anne nor I noticed them changing, but change they did! Now Flurry is convinced that he’s meant to march along the right hand side of the road, against the flow of oncoming traffic, and I’m inclined to relax and let my mind wander, so I don’t notice what he’s doing. It’s ok on the narrow roads around my house, but I’d better stay alert when we roam further afield. Oops! Flurry, we’re meant to be on the other side! Way back in January, I promised to be secretary for a dressage show next Sunday. Then my friend of 47 years decided to have her 50th birthday party the night before. In Castlegregory, Co Kerry, which is about two and a half hours from my home. Well, I couldn’t miss that, could I? So I explained my predicament to the local Dressage Club committee, and fortunately, the nice people at Skevanish, where the show is being held, said they’d run the show if I take entries and do the times. Perfect! Then I started toying with the idea of bringing Flurry…. why not? We’ll only be able to attend a couple of shows this year, anyway, and this one should be just about doable. Seeing as I’m doing the times, I can put myself on as late as possible, giving me plenty of time to get back from Castlegregory. I can also start the show a bit late to suit myself (evil grin). There are definitely some advantages to getting involved on the organisational side of things! I had a lesson booked for Tuesday, and decided to bring Flurry so that I’d have plenty of time to do homework afterwards. The lesson went great! He remembers everything he ever learned, worked on the bit straight away and wasn’t leaning on my hands at all. We were doing leg-yield to the E or B marker followed by shoulder-in down the rest of the long side, and he was doing it! Not super-brilliantly, but hey, we’re both beginners at this lark! We finished off with a run-through Prelim 14. The weakest part of our test will be canter, it’s got a touch of Wall-of-Death about it as we motorbike around the 20-Metre circles, but we’ll have a fun day out anyway. Flurry : WHOA! What the heck is that? Martine : It’s nothing to worry about, silly, let’s keep walking. Flurry : (staring suspiciously at the scarecrow) Hmm, well, if you’re sure it’s ok, I suppose I could walk past it…. AIEEEEEE!!!!! WTF IS THAT? IT’S A GIANT HORSE-EATING BIRD!! RUN!!! RUN FOR OUR LIVES!!! When I managed to pull him up some hundred metres down the road, we had a little chat about brakes, then we carried on and chilled out a bit. 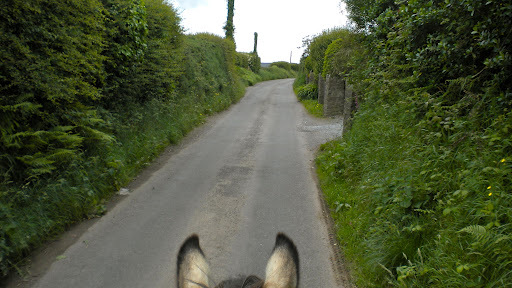 We were heading down a dead end, so of course we had to turn around and pass the scarey scare-horses again. This time I decided to lead him – I figured he’s followed me through so many strange places in France that it might help, and indeed it seemed to. We stood at the end of the field for a while and watched them. 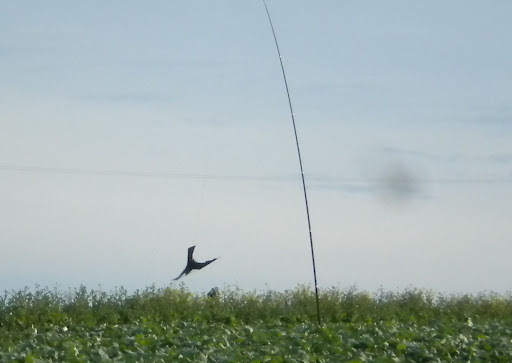 The “man” scarecrow has plastic streamers which flap in the wind, and the “bird” scarecrow swoops and dives continuously. I think if we met them somewhere that Flurry isn’t familiar with, they would have been less of a problem, but he’s passed this field many times and they are “new” which makes them extra scary. We walked up and down past them a couple of times, then I remounted and we carried on home. 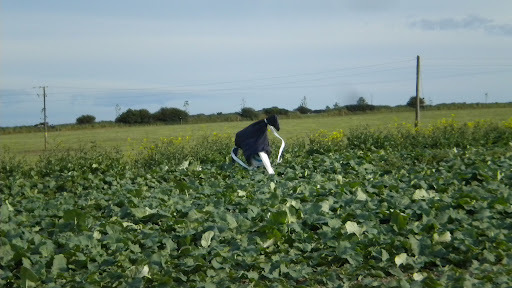 Hopefully there won’t be any scarecrows at the dressage show on Sunday! Silly horses! Giant horse eating bird, haha!Have fun at the show!